Building SUMO Robots using LEGO NXT sets! SUMO for LEGO NXT-G MindStorms Robots! 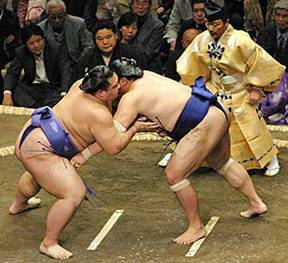 SUMO is a traditional Japanese style of wrestling. The wrestlers try to push each other out of the ring. The heavier they are, the harder it is to push them out of the ring. 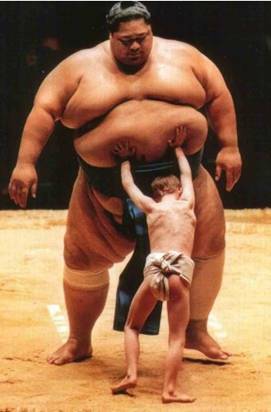 Well, we will not match you up against a real Japanese Sumo wrestler; you would have as much chance of success as the youngster in the photo above! But we could have some fun building and programming some model Robot SUMO wrestlers. We will not stick to the official rules of Mini Robot SUMO, as we are just seeing if we can produce SUMO robots for fun; (but if you are interested in reading the official rules, you can see a summary of them by clicking here . 15.1 The purpose: To push the other robot(s) out of the ring, while remaining in the ring yourself. 15.2 The ring: The official mini ring is about 75 cm in diameter, but we will use the black ring that comes with the home LEGO kit - it is a roughly circular black ring with a light-coloured centre. If this is not available, a rectangular sheet of stiff white A3 paper with black electrical tape around the edges will suffice for our fun purposes. 15.3 The robots: The official mini SUMO robots are 10 cms. or less in width and length; however starting off using our present robots would be a good idea. We can then modify them as ingeniously as possible so that they are good at pushing our opponent out of the ring. 15.4 The start of a bout: The robots will be placed inside the ring, facing away from each other. They must be controlled only by your computer program; you are not allowed to push them around by hand! 15.5 The program: We could use any programming language, but NXT-G is the most convenient, as by now we probably have a fair idea how to use that. 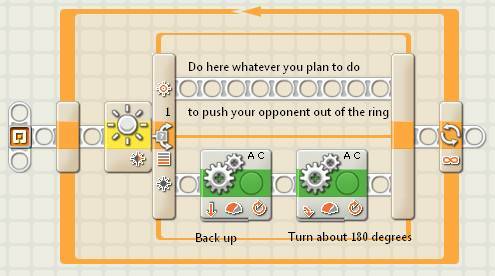 The code above will help your robot turn around when it finds the dark edge of a SUMO ring that has a white centre. If you are not sure how to do this, click here for video help. Why not program the top line with a high speed dash – just to get a first SUMO bout going. We will think about other sneaky bout-winning options later. 15.6 Winning: Score three points for a win, and one for a loss; the winner is the robot with the most points after 2 bouts. If the robots are equal after two bouts, a third deciding bout is run. 15.7 Construction: You could use any of your present robots to start off with, and then modify them later, if you think it worth modifying them. One person’s idea of a mini sumo robot is shown above – the idea is that the sloping front will lift the opposing robot’s wheels off the ground, and thus making it easier to push the opponent out of the rink. What are the possibilities – are any of the following practical? Use an almost flat front sheet (to slide under an opponent’s wheels)? Use more than two powered wheels (to give your robot more “oomph”)? Use tracks instead of wheels (would this help)? Use some sort of battering ram (a third motor to knock your opponent sideways)? Use a “random block” so that your robot does not turn the same amount each time it comes back from the edge of the rink (is this useful)? Use sonar (use the ultrasonic sensor to find your opponent so you can charge at it before it charges at you)? Can you think of other options in addition to the ones mentioned above? There are lots of things you can try – which one is best for your robot in practice? Of course, if you are losing and you are running out of ideas, you can always take a look at what others have done - have you looked at the work of the students of Miss Neilson and Mrs. Airey (see the main menu to the left)? Start competing with your mini SUMO wrestlers! Good Luck – Have fun - Enjoy! To go to other Challenges - click here. 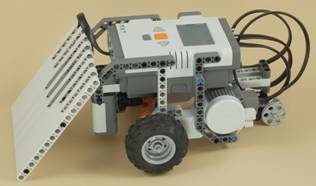 To access a printable three-A4-page Microsoft Word 2003 version of this LEGO NXT MindStorms SUMO challenge - click here.